The rear of a shirt that Silvana Dureny wore to the council meeting on Tuesday, July 8. Photo by Jennifer Jean Miller. 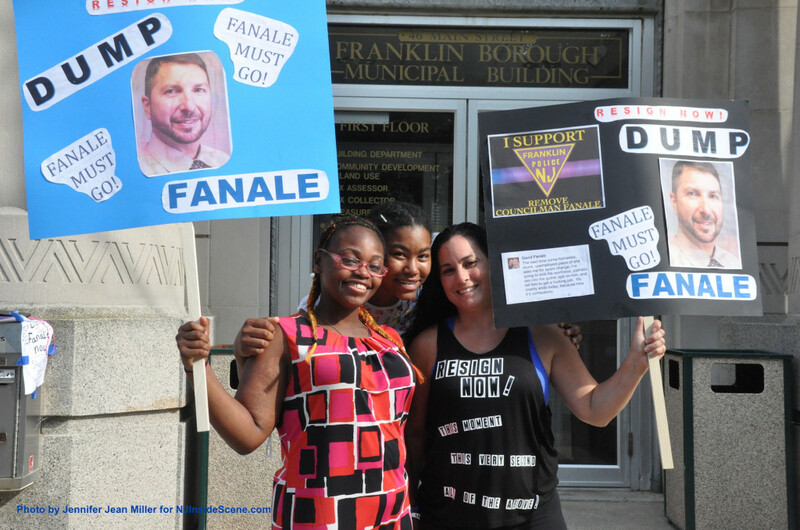 FRANKLIN – About two hundred citizens, and law enforcement officials showed up to the Franklin Borough Council Meeting on Tuesday, July 8, expecting David Fanale, as he stated he would on his YouTube interview, show up to the meeting to make a statement. But Fanale’s chair remained empty the entire time. David Fanale’s chair to the far right, remained empty throughout the entire council meeting. Photo by Jennifer Jean Miller. He warmed up another seat somewhere else. In a bold and taunting move on his Facebook Page, while the meeting took place in Franklin, Fanale posted a status at the Roxbury Township Administrative Offices, simply marked “Council Meeting!” An anonymous source showed NJ Inside Scene Fanale’s own video footage, of his perspective at that meeting, where he walked around and socialized with attendees there, while attendees in Franklin came out in force to air their upset at Fanale. “I don’t like that he put those things on Facebook,” 11-year-old Katie Vanderwiele choked out in between sobs to the council. She wore her father Richard’s police hat, and badge who was a Franklin Borough Police Officer from 1975 to 2003, until his retirement. He passed away after a long illness in 2011. Jennifer Kovach, Vanderwiele’s mother, comforted her daughter. She said she had challenged Fanale at a council meeting after the incident at the Pet Center on Route 23, when Officer Rafael Burgos responded to the structure fire and rescued pets, and was injured. Fanale lambasted Burgos, and caught flack for his criticism from citizens. On a positive note, retired Wayne Councilman and SPCA officer Alan Purcell honored Burgos on Tuesday in front of the crowd for his valor. Law enforcement officials showed to the front of the Franklin Borough Municipal building beginning around 6 p.m., waiting out in the heat, along with civilians. Many of the civilians toted signs, asking for Fanale’s recall. Prior to the parties entering the building, a group of pipers marched onto Main Street towards the crowd. 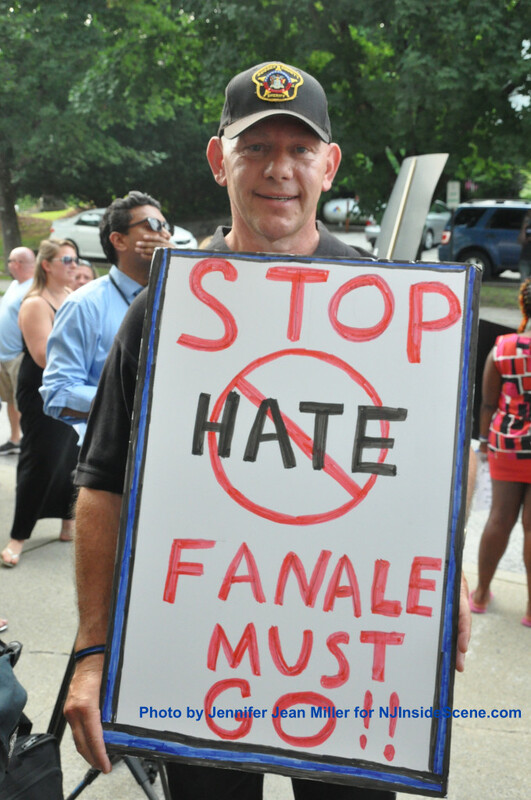 Resident Gar Van Tassel with his anti-Fanale sign. Photo by Jennifer Jean Miller. Emotions were high as individuals poured into the council chambers upstairs. Others waited outside, until they were able to enter into the building. 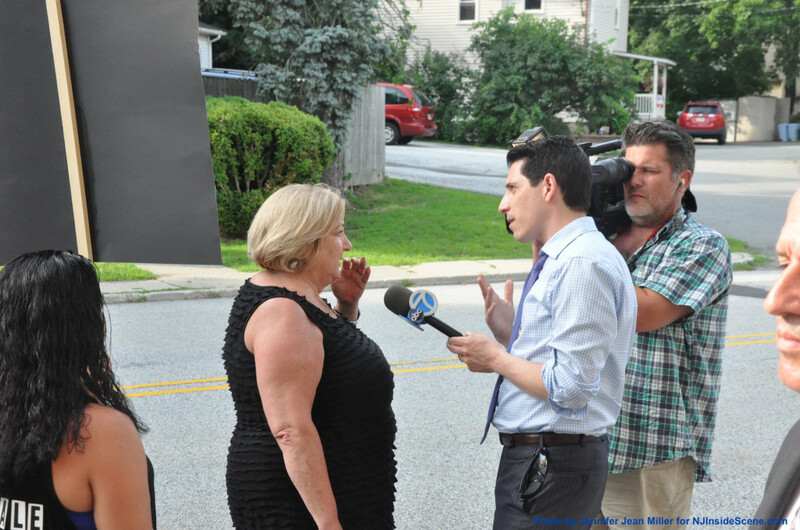 Resident Donna Arrigo as she is interviewed by Channel 7. Photo by Jennifer Jean Miller. At the start of the council meeting as Fanale did not show, fellow members of the council spoke out about the latest occurrences involving Fanale. Mayor Paul Crowley started off by telling the crowd he is a proponent of free speech and the First Amendment. Crowley confirmed he did, however, ask Fanale to resign, which was a personal decision and not that of the council’s, he said. He expressed to the public that the mayor and council could not remove an individual for the thoughts that they have. “There is no way for this council to take any action against Mr. Fanale, whether we wish to or not,” he added. He said if voters wished to recall Fanale, they could go to the county board office to do that. A few members of the council made remarks prior to the open to the public session. Freddie Babcock was one, who apologized for his negative words against the police department on May 22. Babcock asked to meet up with police officials on a separate occasion to further put the past behind them. Councilman Nicholas Giordano spoke about his interview on NJInsideScene.com, and received a round of applauds when speaking out, advising the public he did not agree with Fanale, and would be the first one to sign his recall petition. Councilman Joey Limon told the public he backed the mayor’s decision that Fanale should back down. As the public began to speak, several of them told Crowley he should resign, while others thanked the mayor for his stance. Each member of the public who spoke had three minutes to speak, and the mayor allotted approximately one hour. Many referred to Fanale as “cowardly,” for not showing to the meeting. Others suggested that the mayor should strip him of his committee affiliations and other abilities to participate. Assemblywoman Alison Littell McHose (R-24), a longtime Franklin resident, whose great-grandfather was one of the borough’s first councilmen. She spoke of the well-known run-ins between her great-grandfather and the first police chief, and explained the two still respected one another. Other members of the public spoke, some sharing of their stories of loss, including parents who lost children in the line of duty, who were heartbroken because of Fanale’s cartoon posting involving the thin blue line. 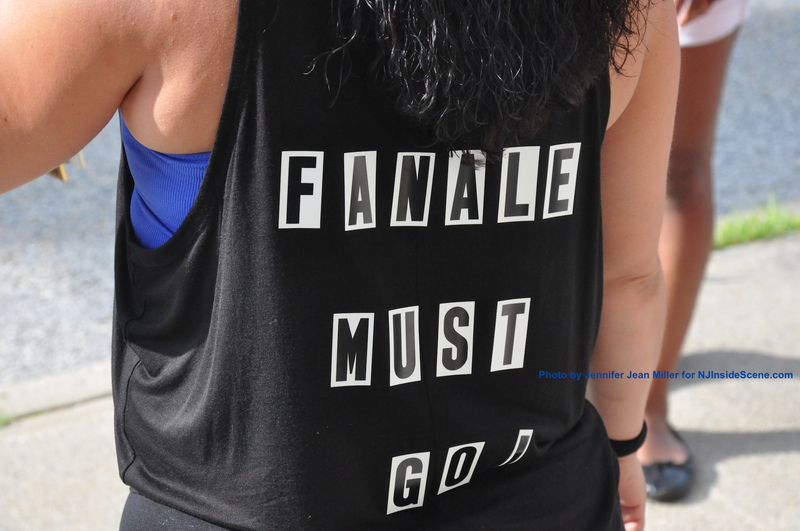 Others spoke of losses and pain they personally incurred from Fanale. One person was Silvana Dureny, who attended the event with her daughter Dominique, and friend Elisha Johnson. 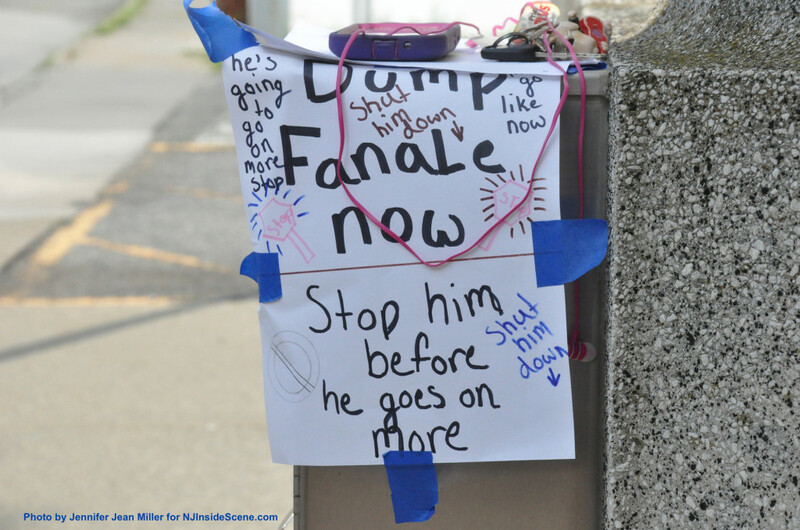 Dureny spoke at the podium at the meeting to tell her story, and the three ladies were the first on scene to enthusiastically pump their “Recall Fanale” signs, in front of the municipal building. From left to right, Elisha Johnson, Dominique Dureny, and Silvana Dureny, before the meeting. Photo by Jennifer Jean Miller. “He is my neighbor, he moved in seven months ago by me,” she told NJInsideScene.com. 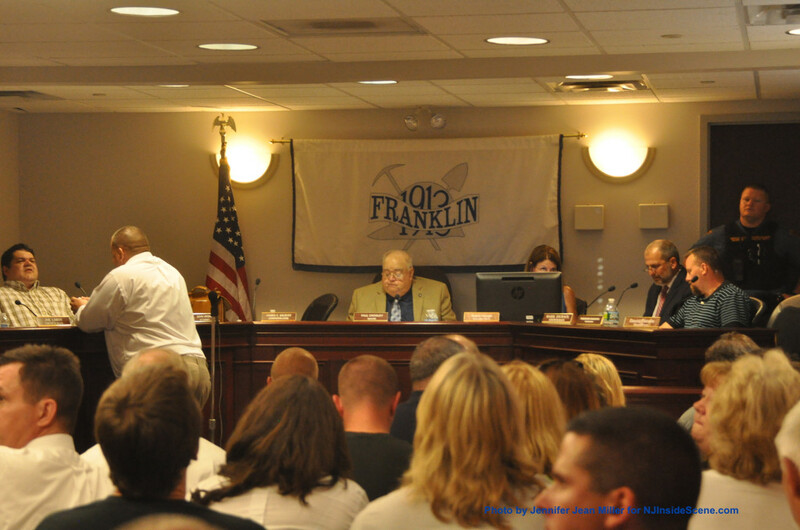 He did so, pointing out to Dureny she said, that he was a Franklin Borough Councilman. And some stated the same as Dureny in their own way. One of them was 11-year-old Mia Martin, who consoled her friend Katie Vanderwiele, as she cried, also with tears in her eyes. A sign posted in front of the Franklin Municipal Building prior to the meeting. Photo by Jennifer Jean Miller. Stay on the scene with NJInsideScene.com…click here to follow us on Facebook.